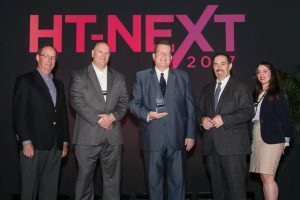 San Jose, CA – April 13, 2017 – Angie Hospitality, the creator of Angie, a revolutionary voice-based hotel guestroom technology solution, is excited to announce that it has been awarded the 2017 TechOvation Award by HTNG during HT-NEXT in Orlando, Florida. A revolutionary technology platform designed to take the hotel guest experience to the next level, while enhancing operational efficiency and revenue, Angie was officially launched during the TechOvation semi-finalist round at HT-NEXT and will soon be servicing guest needs in properties around the globe. Angie Hospitality’s launch of its voice-activated virtual guestroom assistant and amenity control device raises the bar for available technological solutions, as hoteliers look to implement more advanced solutions that meet and exceed the ever-increasing guest demand for technology and convenience. 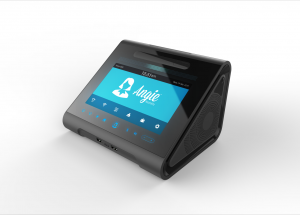 Featuring a highly intuitive multilingual voice interface that responds to both guest and staff requests, Angie brings guest service into the digital automation era, replacing an array of outdated devices and services by acting as a single source for virtually any guest need. With Angie, a simple voice command provides guests with the ability to order room service, transportation, make reservations or learn more details about the hotel or surrounding area. Using only their voice or Angie’s touchscreen display, if preferred, guests can also make phone calls, play music, set an alarm and can even make use of a convenient night light that changes color based on user preference. Guests can also access news, weather reports, personal flight information, and more, making Angie’s ability to act as a personal concierge virtually limitless. Acting as a robust in-room access point, Angie creates a private guestroom Wi-Fi network that ensures that guests can leverage a secure and reliable internet connection during each stay. Using open standards to easily integrate with existing hotel systems, Angie takes guest convenience even further by offering voice control over guestroom amenities such as lights, thermostat, television and drapes. Other deciding factors that led to Angie’s selection by TechOvation judges include the platform’s ability to store and automatically recall guest preferences such as lighting, temperature, alarm and television settings, as well as Wi-Fi passwords, each time they check into a hotel. For hotel chains, such data can be securely shared across their range of properties, providing guests with instant and customized convenience, no matter where in the world they visit. With the use of occupancy sensors, Angie also offers enhancements to operational efficiency by resetting temperature and lighting controls to preset levels when guestrooms are unoccupied. Its revenue enhancing abilities include sending customized promotions and informing guests of available amenities such as spa services or dining options, and even taking reservations. Angie is scheduled to be implemented at several hotel properties later this month and will be available for order beginning in late June for shipping in Q3. For more information on Angie’s full range of features, please visit www.angie.ai. About Angie Hospitality | Angie Hospitality, led by industry veterans, designs and develops the only voice-activated, Wi-Fi and room control technology solutions built just for hotels and resorts. Angie, the 2017 HTNG TechOvation Winner, is the world’s first cloud-managed, enterprise-class voice- and touch screen-based guestroom assistant and integrated room control device. Angie delights hoteliers and guests with a highly intuitive multi-lingual voice interface that responds to guest and staff requests; integrates with guest room lighting, thermostat and televisions; interacts with room service, housekeeping, maintenance and the front desk and even acts as an energy management system. Angie can replace the hallway Wi-Fi access points, guestroom telephones and alarm clocks and has the ability to remember guest preferences if they choose. Angie make all guestrooms, smart rooms by driving increased operational efficiencies, revenue and guest satisfaction. With headquarters in Silicon Valley and London, Angie Hospitality currently offers service in North America and Europe, expanding soon to Asia Pacific and the Middle East. For more information on Angie Hospitality, please visit www.angie.ai and connect with us on our social media channels – Facebook, Instagram, Twitter and YouTube.